Have you ever wondered about the Active Times on recipes? I think the times listed must be for people who have a kitchen staff at a sous chef and a prep line. I allow at least twice the time under Active Time for my prep work. I think my knife skills are pretty good, but somehow prep just takes time with all the washing, trimming, peeling, chopping and measuring. It is worth the work when a finished recipe tastes as good as it reads. And, when all the work with sharp things is finished, the cook should be rewarded with a cocktail sipped as the dish cooks! 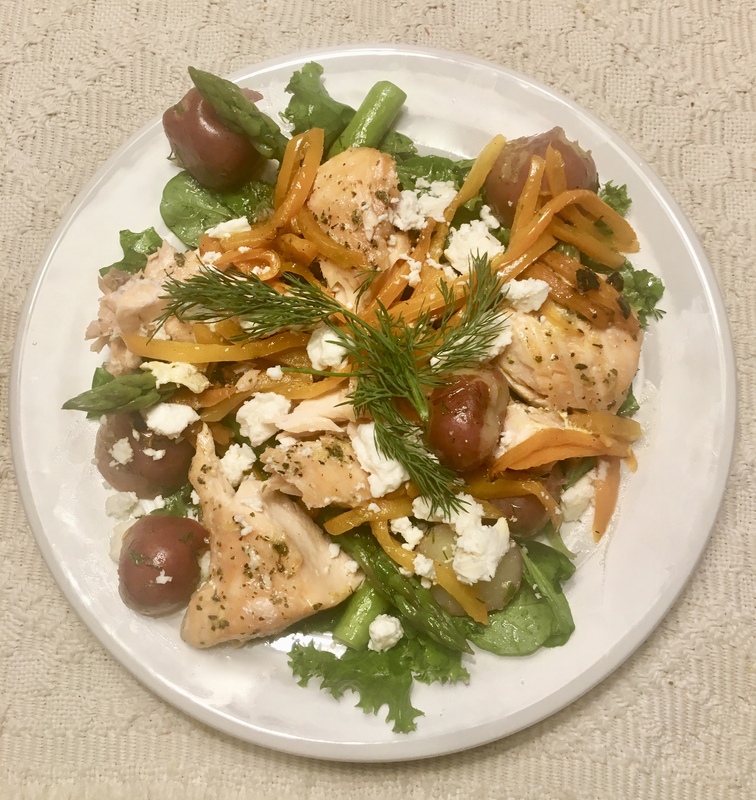 Such was the case with Lemon-Roasted Salmon topping a salad with a lemon and dill vinaigrette that took bout 45 minutes of active prep and closer to 30 minutes of cooking time that the 20 minute Active Time and 20 Minute cooking time listed. The recipe suggested escarole, but I did not find it in either of the two stores I visited. I used curly green leaf lettuce and maché rosettes as my salad base. The maché had just enough bite to complement the other flavors of the dish. Lemon-Roasted Salmon with asparagus, new potatoes, roasted orange bell peppers on a bed of leaf lettuce and maché and topped with crumbled feta and dill fronds. So worth the prep time it took! Place salmon in a baking dish and rub with lemon zest, oregano, salt, and pepper on all sides, then coat with oil. Arrange peppers around salmon. Bake until salmon is firm but still pink in the center, about 20 minutes (if you prefer salmon more well done, cook an additional 5 minutes). Set a steamer basket in a large pot filled with 2″ water. Cover pot and bring water to a boil. Add potatoes, cover, and steam until tender, 10–12 minutes. Add asparagus to potatoes, cover, and steam until crisp-tender, 3–5 minutes. Meanwhile, whisk oil, lemon juice, honey, salt, pepper, and 1/4 cup dill in a small bowl or measuring cup. Toss escarole with half of the dressing in a large bowl, then transfer to a serving platter. Toss potatoes and asparagus with remaining dressing in same bowl, then arrange over escarole. Flake salmon into large pieces and arrange on platter. Top with feta, peppers, and dill sprigs. A recipe called Fridge-Dive Pesto Pasta caught my eye. Described as a rewarding way to clean out the fridge hooked me. My fridge has a way of collecting leftovers from a recipe that needed a pinch of this or a quarter cup of that. I deal with it by buying spices from the bulk purchase jars at a couple of the better markets in town. I can get things such as a teaspoon of turmeric for pennies rather than a one ounce jar for dollars. It’s a good way to try out new flavors without breaking the bank or cluttering up the cabinet with more little jars. I can even get loose carrots one at a time, but somethings just come in larger sizes and result in leftovers. There is usually a mystery bag in the bottom of the crisper drawer that may or may not contain something that had been there way too long. Fridge diving seemed a good idea to cope with those mysteries. Below is the inspirational recipe followed by what actually happened one night in my kitchen. Yes, I was playing with my food — again! Fridge-Dive “Pesto” with Pasta and Shrimp. Really good sauce made (mostly) green stuff in your refrigerator crisper. It’s cooked, a little, and has no basil, so put the “pesto” in quotes and dive into it! As I inventoried my crisper drawer, I thought about pesto. Originally, pesto was an uncooked sauce made with fresh basil, garlic, pine nuts, parmesan or pecorino cheese and olive oil. Now we chop up almost anything and call it “pesto.” I am putting the “pesto: in quotes for this recipe because it has no basil and it is cooked! What I appreciate most about this recipe is its flexibility. The technique for building the pesto was very helpful. 1 gigantic head of Bok choy purchased in desperation when I couldn’t find baby Bok choy. I found the baby bok the next day and the gigantic one was just sitting there sadly abandoned. So far, so good. I wasn’t about to put pricey pine nuts into an experiment, so, I though let’s go for a different spicier crunch! I bought four snack packs of chile peanuts, a couple of limes and (per the original recipe) ricotta salata because it is a terrific dry, slightly salted ricotta that crumbles nicely. I decided to add some more protein to the dish, so I got shell-on raw shrimp. Rinse and drain shrimp, blot dry with paper towels, toss with a liberal amount of Tajin Chili Lime powder and let sit while you do the rest of the prep and cooking. Experience the joy of washing and chopping the Bok choy, parsley, some of the cabbage and savor smashing garlic cloves! Note: You’ll have to jump back and forth to the original recipe what I did how it influenced what I actually did. Blanche the chopped greens until the Bok choy and onion wedges until tender, the immerse them in ice water to stop cooking and retain the bright green color. Use a spider or tongs or a slotted spoon to remove the greens. Save the vegetable water, or broth if you want to call it something fancy, for cooking your pasta. More fun will be had draining, squeezing and patting the greens dry. Be sure to squeeze as much water out of the vegetables and pat them as dry as you can or you’ll have soggy “pesto.” Place one packet of chili peanuts in a food processor and chop into a coarse powder. The peanut powder will help with moisture when you add the greens. Process until a paste is formed. Add a good shot of olive oil, pulse until blended. Add a packet of chile peanuts and a couple of tablespoons of crumbled ricotta salata. Pulse a few times to reduce size of peanuts and mix the peanuts and ricotta into the “pesto.” Add the juice of half of lime. When the pasta is done, use tongs to transfer it to the pot of “pesto.” Gently stir to blend and add the butter called for in the recipe. Reduce the heat to low and cook the shrimp in butter until curled and flesh is bright pink throughout. Place pasta and “pesto” mix in a shallow bowl, top with shrimp, sprinkle with whole chile peanuts and crumbled ricotta salata and a couple of lime wedges. Dive in. Sometimes, I get the urge for things that are easy to make, yet hard to spell. They are inspired by Greek, Italian and French dishes I’ve enjoyed. And they have z’s and double l’s and i’s that must be remembered and put in the right order. The other day, I saw a lamb frittata recipe online and bought some ground lamb, thinking I’d make it. I decided to go another direction because I didn’t want to buy four packs of fresh herbs that together, cost more than the lamb. I knew I wouldn’t be able to used them up before they went beyond wilt in the crisper. Instead, I decided to make stuffed lamb meatballs with an eggplant dish on pasta. Of course, I didn’t have a recipe, but that seldom deters me. Stuffed lamb meatballs with tzatziki sauce, ratatouille and bucatini with grated parmesan, a hard to spell dinner. Meatball Sauce: about a half cup Greek yogurt, one snacking cucumber, grated and squeezed in paper towels to reduce moisture content and chopped mint, minced garlic and chopped lemon zest. A little salt. Meatballs: half a pound of ground lamb, a handful of panko crumbs, one beaten egg, and chopped mint, lemon zest, minced garlic in quantities that looks right on the cutting board. One mozzarella cheese stick cut into six pieces. a little salt and pepper. Eggplant: one medium to small eggplant, cut into one-inch cubes, two Roma tomatoes, one small onion, coarsely chopped and two or three minced garlic cloves. Some olive oil. A little salt. Pasta: two servings bucatini pasta. I measure the pasta by measuring enough to fill the circle made by my thumb and forefinger. Works for spaghetti, fettuccine and bucatini, with a few extra bucatini noodles added because they are thick and take up more room in my measurer. Meatball Sauce: Stir chopped, minced and grated ingredients into yogurt and let sit while you cook everything else. Before serving, taste and adjust salt, if needed. Because the sauce has cucumber in it, you could call it tzatziki. Meatballs: Beat egg in medium bowl, stir in panko, herbs and zest. Add pinches of ground lamb and squish it all together with your fingers until well mixed. Shape into six mostly same sized meatballs. Make an indentation in each meat ball with a finger and insert one piece of the mozzarella. That warm bit of cheese in the middle make the meatballs special! Cover the cheese and roll the ball round again. Brown on all sides in a deep skillet. Cover and let cook until an internal temperature of 145º – 150º. Remove from pan and cover while they rest. Eggplant: Put a healthy splash of olive oil in a deep saucepan. Soften eggplant a little in the oil. Add onion and garlic and a little more oil an let the onion begin to soften. Eggplant will take up the oil, so keep and eye on it all the first few minutes. Quarter the tomatoes and squeeze the quarters into the pan with the other vegetables. Tear juiced tomatoes with your fingers and add to pan. Add a little water and simmer until vegetables are tender. Season with salt and pepper when cooked. If you added chopped red and green bell peppers and squash, you could call this Ratatouille. Pasta: Boil pasta in salted water per package directions. Don’t overcook the pasta. Save about a cup of pasta water and drain off the rest. I return the drained pasta to the empty pot, cover it and keep it warm until serving. A quick swirl with the reserved pasta water refreshes the pasta. Drain again before serving. I’ve been playing with my food again. I recommend that everyone try it. It can be satisfying on many levels. This time I began with a recipe I’ll share below, after I tell you what I did. The recipe for a Carrot and Radish Salad read well and the accompanying photo was attractive. The recipe used orange carrots and red radishes and oil-packed canned tuna. As a rule, I’m not a fan of canned tuna, especially in soup-based casseroles or pasta salads with mayo and pickles. The one embarrassing exception is I love the scroodle tuna salad at Souper Salads. I haven’t figured out what is in it that makes it so good, but it really is tasty. I decided to up the ante for last night’s salad with rainbow carrots and Easter egg radishes and tuna steaks. My playing with it made a very bright and colorful salad that was a great accompaniment to the seared tuna. The recipe’s vinaigrette was complimentary to both the vegetables and the tuna. I served chunks of baguette with butter on the side because everyone in this household loves a rare treat of white bread and butter. NOTE: I used a handheld mandoline to slice the vegetables. Even the thinnest slice was a bit thick for the carrots. Next time, I’ll just use the vegetable peeler on the carrots to make them a little more delicate. 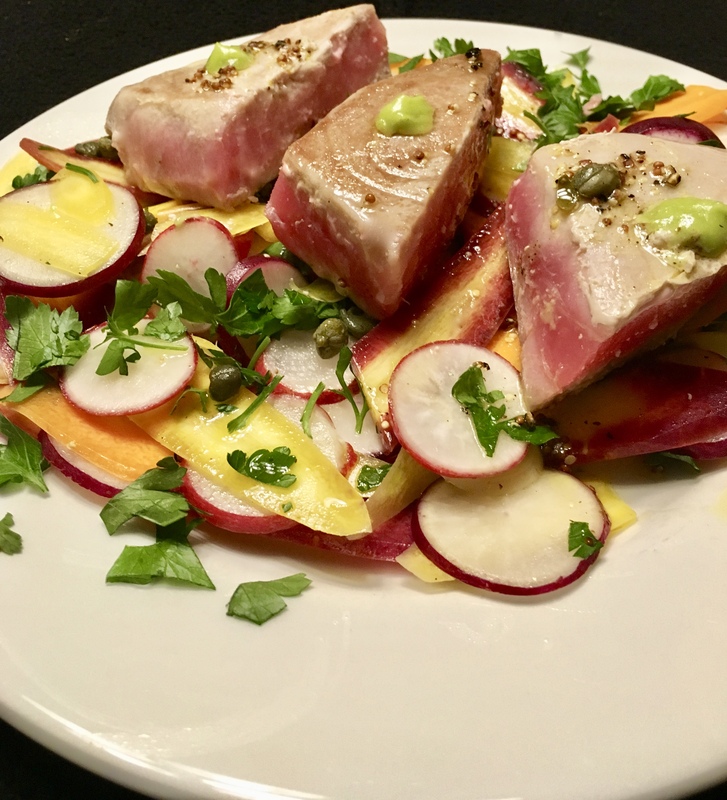 Carrot and Radish Salad with Seared Tuna – what happens with you play with your food. Slice radishes into very thin rounds. Using a vegetable peeler, peel carrots lengthwise into long, thin slices. Combine 2 tsp. salt and 3 cups ice water in a medium bowl and soak radishes and carrots for 10 minutes. Drain and pat dry. Meanwhile, whisk lemon juice, vinegar, mustard, pepper, and remaining 1/4 tsp. salt in a small bowl until combined. Whisk in oil in a slow stream. Toss radishes, carrots, and capers in a large bowl with just enough vinaigrette to coat. Divide among 4 plates and top with tuna and parsley; drizzle with remaining vinaigrette and top with a few grinds of black pepper. Note: I used rainbow carrots and Easter egg radishes, seared tuna and a tiny dab of wasabi paste on each chunk of tuna. Otherwise, I followed the recipe. The vinaigrette is very nice. Sometimes, you want something so much you just splurge and do it! I’d been staring at clams in the meat case at the store for several days. I’d looked at clams for several days and convinced myself that they had been there too long and would not be a wise purchase. Buying Littleneck clams is like buying rocks – lot of weight on the scale at a dear price. I asked the meat guy when they would be getting a fresh shipment. He said the next day. The die was cast. Part of my craving was stimulated by finding a recipe for clams with a white bean and fennel sauce. That’s a trifecta of favorite flavors. I showed up mid-morning of clam day and my meat guy, with a huge grin on his face, brought out a box of clams from the cooler and opened it for me. I asked for 18. There were 21 in the box. Naturally, I threw caution to the wind and took them all. They weighed in at a little over four pounds. Next stop was the produce aisle for fennel. Wouldn’t you know they had one large bulb, organic, of course (kah-ching, kah-ching at the register!) I always have cannellini beans in the pantry and rosemary is growing in the yard, so I was set. The recipe was called Clams with White Bean Sauce. 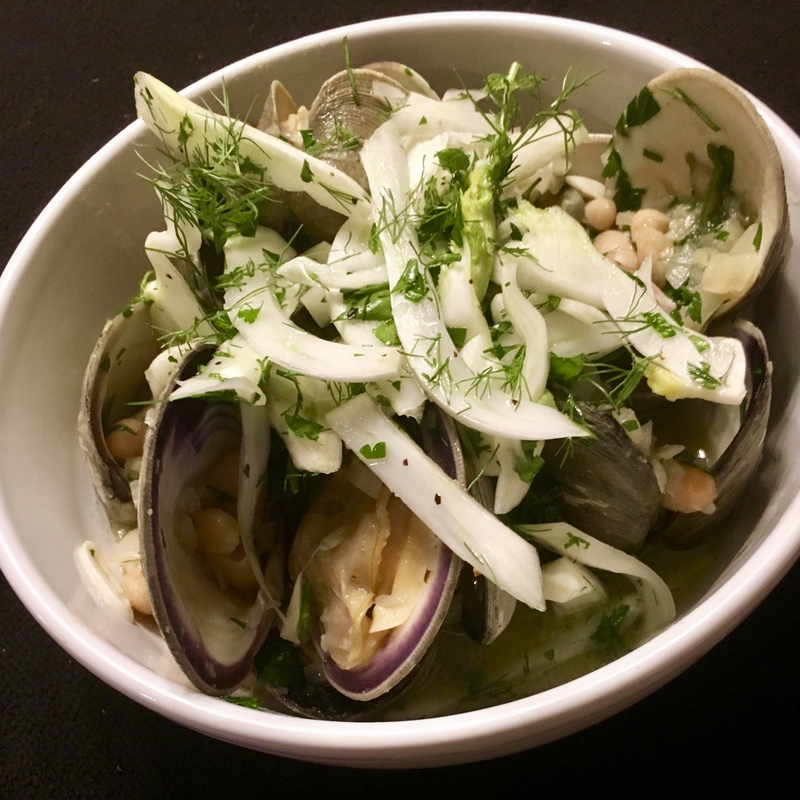 I’m renaming it Clam Trifecta for three flavors I love – clams, fennel and cannellini beans. Diced fennel cooked in the sauce and a fennel salad on top were pure bliss and a good foil for the briny clam liquor. Toss beans in a medium bowl with a drizzle of oil; season with salt and pepper. Set aside. Halve fennel and remove fronds (don’t toss the fronds!). Thinly slice one half of fennel and transfer to a medium bowl along with fronds. Place a damp paper towel directly on fennel to help prevent browning and set aside. Finely chop remaining half of fennel, then thinly slice garlic. Heat 1/4 cup oil in a large heavy pot over medium. Add chopped fennel, garlic, and rosemary sprig and cook, stirring often, until fennel is translucent and tender but still has some bite, about 5 minutes. While that’s happening, remove 2 wide strips of zest from lemon with a vegetable peeler. Halve lemon and pick out seeds. Coarsely chop parsley. Add clams and lemon zest to pot, squeeze in juice from a lemon half, cover pot, and cook until some clams start to open, 5–7 minutes. Toss and stir clams; use a slotted spoon to transfer any open ones to a medium bowl. Cover pot and cook until remaining clams open, checking sporadically and transferring them to bowl as they are done, 7–9 minutes; discard any clams that don’t open. Add reserved seasoned beans to pot and stir to combine; loosen sauce with water if it looks too tight. Return clams to pot, add half of parsley, and toss well. Add remaining parsley to bowl with reserved sliced fennel and squeeze remaining lemon half over. Season fennel-herb salad with salt and pepper and toss to coat. Drizzle with a very small amount of oil and toss again. Serve clams topped with salad and toasted bread for dipping into sauce. Note: I worried about there not being enough liquid to make the broth for dipping. I was tempted to add some white wine. When the clams released their liquor, there was plenty of liquid. I did add about a quarter cup of water, per the recipe – just in case.